When chunking with, or live-lining large baits (bunker/pogies, porgies, herring, shad, etc.) 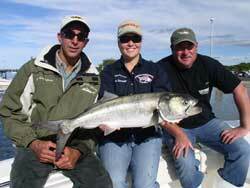 for bluefish, we recommend a conventional rod and reel combo rated for 30-40lb mono. The optimal rod is a 6’6″ to 7′ rod with medium-fast to fast action. The rod needs to have enough backbone to pull the hook out of a large bait and into the mouth of the bluefish. We recommend loading the reel with 30-50lb mono line attached to a 12-16in 45-60lb nylon coated black multi-strand wire leader using a 75lb barrel swivel. The rig is completed with a 8/0-9/0 offset octopus (beak) style hook with a turned-down eye. The turned down eye is particularly useful because the loop of the wire leader can be passed through it. Some anglers use 40-80lb test single strand leader instead of the multi-strand leader. The best hook placement for chunk baits must allow for the hook to easily pulled from the bait. There is never a need to hook the bait deeply. It may be necessary to hook live baits more deeply so they cannot work their way off the hook. We typically use a 7 foot spinning outfit loaded with 30-50lb braided line. The thin diameter of the braided line allows use to easily cast an un-weighted 10/0 classic treble hook over a bunker school. We reel very slowly and when we feel a slight tick on the line we take a swing to set the hook. This works nearly every time.